Be it the architect, builder, or repair contractor at blame, there are many defects to be found within the walls and floors of a home. functionality because of those defects, and the owner is left unhappy and confused about why their home is so distressed and fatigued. like a plate). This plate can bend like a rubber band, causing the floor above to easily sag and bow. there is no choice but to correct it. "A house can settle all at once, and not sustain noticeable damage"
fix and sometimes it will not be practical to get things back to a level and plumb condition. the joist under the partition is doubled to support increased loads frequently occurring adjacent to the partition. Sometimes we'll find a load bearing wall has been built in the same direction as the floor joists, and is IN-BETWEEN the floor joists. wall was built over a single floor joist, the wall is too heavy for the joist, and the joist will need to be doubled-up for better support. systems are needed within a crawlspace foundation. beams and joists to weaken over time. wood stuck in the ground under the structure. placed on no further than 6 foot centers. piers are placed too far apart. "Improper sizing and spacing of floor joist and/or beams can increases the possibility of sagging and settlement"
give it strength, without the added expense of replacing any lumber. "Cutting framing members to install plumbing or mechanical components can also weaken the structure"
cannot be closer than 2" to the top or bottom edges of the joist. 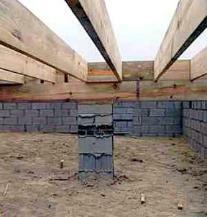 joists supported by ledgers, cannot exceed one-fourth the actual joist depth. 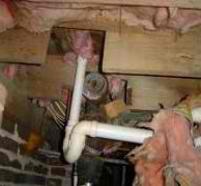 structural hazard, it will need to be addressed, and should always be evaluated by an crawl space foundation repair specialist. of crawl space foundations can be very complex. It is usually a case of repairing it and the costs generally varies from job to job. What this entails varies tremendously based on what damage has occurred. "Settlement or defects are sometimes caused by poor construction or architectural design"